The Renaissance Monumental Ensembles of Úbeda and Baeza hold the best-preserved examples of Italian Renaissance architecture in Spain. Both Andalusian towns developed a certain wealth in the 16th century and competed with each other in the design of Renaissance buildings. 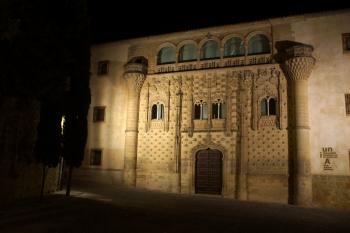 In Úbeda, the aristocratic families where the driving forces. While in Baeza (8 kms away) the town council ordered fabulous public works. The Spanish architect Andrés de Vandelvira was responsible for the design of buildings in both towns. A lot of thinking has gone into the acceptance of these two towns in the World Heritage List. The site was deferred twice, and not many beneficial terms could be found to recommend it: the historic city centres aren't special enough on the Spanish scale, the Renaissance areas are no match for those in Italy, the concept of 'twin towns' doesn't appeal to ICOMOS and the restorations lack quality. The final decision made by the World Heritage Committee applauds the introduction of Renaissance ideas to Spain. Úbeda and Baeza are well signposted from the highway near Jaen. Both towns are very proud of their long sought after status as 'Patrimonio Mundial', and have various colourful roadside signs pointing that out. I started my visit in Baeza, an atmospheric little town despite the fume blowing factories in its outskirts. The Renaissance monuments are scattered around the city center, amidst many more recent buildings. Úbeda is much bigger and sees a lot more traffic than its counterpart. It took some time before I could find the famous Vázquez de Molina Square. Many of the palaces here are designed by designed by Andrés de Vandelvira, whose statue also is located at this square. Many of the buildings are now in use for offical purposes or as a parador. Although Úbeda and Baeza are worth a short visit, I would rank them at the bottom end of the World Heritage list. Best part of the day was the drive there from Granada, passing endless olive plantations. I visited this WHS in September 2017. I allowed 2 half days for both towns and spent a night in Baeza. 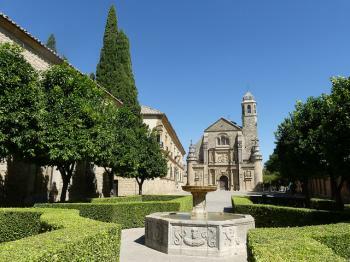 Ubeda is the better ensemble of the pair with more interesting Renaissance buildings and more to see. Baeza is mostly famous for its neatly carved fountains and the still active old university with a facade which reminded me of the Lonja de la Seda in Valencia. You won't gain much in terms of OUV (if there is any) by visiting the church and palace interiors. However, if you have some time, I'd recommend going for the El Salvador Holy Chapel which is closed during siesta time. The highlight of my visit was the facade and square of the El Salvador Holy Chapel (photo). The church facade in a way is quite similar to the one in Vezelay, France. The UNESCO inscription plaque (with no mention of Baeza) is placed on the right hand side (closest to the fountain) of the Vazquez de Molina Palace. In the middle of the historic centre of Baeza there is a bronze sign on the floor just after a pedestrian crossing but it is hardly recognisable. Both towns are very close to each other and both historic centres can be easily covered on foot. In Ubeda, I used the convenient indoor parking named Aparcamientos Ubeda in Plaza Andalucia while in Baeza I just parked my rental car in front of the hotel. Both towns are quite similar to Pienza in Italy but are still not comparable to the Italian WHS. They aren't the best examples of Renaissance towns in Spain and I failed to notice any OUV. That said, they are quite off the beat track at least if you want to escape the never-ending hordes of tourist groups in the bigger cities of Andalucia. The Andalusian twin towns of Úbeda and Baeza in the province of Jaén are considered the best examples of Renaissance style in Spain. However, these two small towns cannot compete with the major centres of Renaissance in Italy, and I would not rank them among the best Spanish WHS, but nevertheless we enjoyed our visit. In both towns, the inscribed area is rather small, just a historic square and a few cobblestone streets. There are no outstanding buildings, the charm is more in the harmony of the architectural ensemble. And that it is calm and sleepy, there are not many tourists, a pleasant change to other sites in Andalusia like Granada or Cordoba. Coming from Granada by rental car, we first made a detour to the Jaén Cathedral, a possible extension that was withdrawn in 2014 after an unfavourable evaluation by ICOMOS. Well, it's a huge cathedral, quite nice, but it would not add much to the already inscribed parts. 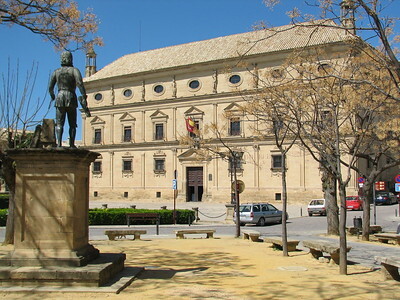 In Úbeda, the inscribed area is a bit off the modern town centre, it consists essentially of the buildings and monuments around the Vázquez Molina Square: Basilica Santa María, Sacra Capilla El Salvador del Mundo, Vázquez de Molina Palace (the town hall), the Palace of the Déan Ortega (today a Parador), the Pósito (former granary, currently the police station). Both churches can be visited with an audioguide, the town hall is accessible during office hours and the Parador has a nice courtyard where we took a coffee break. Baeza is only a eight kilometres west of Úbeda, the main sights are the cathedral (visit with audioguide) and the Square of Saint Mary with a nice fountain of the same name. Several of the other palaces are used by the Universidad Internacional de Andalucía and you can take a look inside to see the entrance halls and courtyards. Most remarkable is the Palacio de Jabalquinto with an impressive façade (photo) and a richly decorated Baroque staircase (accessible from Monday to Friday, 9 am to 2 pm). It is hard to say which of the two cities I would prefer, probably Baeza, mainly because we stayed the night in Baeza and at our stroll through the sparsely lit old streets, we felt like taken back in ancient times. If you plan your visit, you should note that the churches have the typical opening hours in Andalusia with a long siesta break in the afternoon starting at 2 pm. This is true for most sights in Spain and especially in Andalucia, and should be considered if you have a tight schedule. The best is to adapt yourself to the rhythm and also take a siesta. On our round trip we often use these hours to move from one place to another, the main destinations in Andalusia are in a distance that can be covered in less than three hours by car. These 2 small towns in Andalusia are reputed to offer Spain's finest Renaissance architecture. Their WH inscription may be justified because of the influence they had on Latin American architecture, and because there are not that many Renaissance buildings in a country that is full of Gothic, Moorish and Baroque buildings. In Baeza, I visited the cathedral and walked some of the well-preserved old town streets. In nearby Úbeda, most important sights are grouped around the Vázquez Molina Square. The most impressive for me was the Salvador Chapel, which features a really brilliant interior and altarpiece. All in all, I was not overly impressed with either town, although to be fair, it was pouring heavily and was very cold, which added a somewhat gloomy atmosphere. Also, being stuck between Córdoba and Granada, it is obviously hard for these towns to compete with either place, which are really world-class attractions. 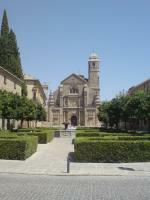 I also visited the massive cathedral in nearby Jaén, which could be added to the site in the near future. It was quite impressive and should make a useful addition. The main features of these two towns is that they are easily toured on foot, and there are frequent buses connecting them together, and to Linares-Baeza station. 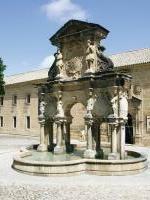 In Baeza I visited the cathedral and the monumental buildings and fountains in the Plaza del Populo and the Plaza de la Constitucion. In Ubeda I visited several palaces, the churches of Santa Maria and the Saviour of the World as well as the archbishop's prison, and these were just a sample of what was on offer. Ubeda and Baeza are two of the most gorgeous cities I have ever been too. We spent hours just wandering the streets and trying to cram in a visit to every historic building open to the public. What was best was that it wasn't full of tacky touristy-ness, we were two of only about 5 English speakers that we saw all day. Hooray. All the staff in the museums/churches etc were very polite and helpful and patient enough to listen to my beginner level Spanish. Both of these twin towns have interesting historic background so before visiting them it is helpful to learn a bit about them. We visited this site in very hot summer day in 2007. As a warning please don't do the same mistake as we did. As during siesta the towns are completely empty, everything is closed and there are no people you can chat or ask. In later ours this is comming to improve so you slightly change your mind from "very boring" to "interesting". Ubeda is the bigger town containing many of religious builings and palaces from Renaissance period. They act together in harmony. The most interesting place is Sacred chapel of the Savior of the world placed near the main square. In size small but inside is very nicely decorated. Baeza is a smaller sister which i liked more - mainly because our evenings visit. If you are travelling around visit this site, otherwise it is nothing really special why to travel here. 3.0: Daniel Chazad Chessjsr Craig Harder Nolan B.